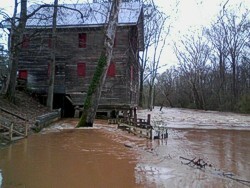 Heavy rains on Friday 3/3/2012 caused the water in Talladega Creek to rise significantly. Past efforts to divert water away from the Mill's foundation have proven to be unsuccessful. 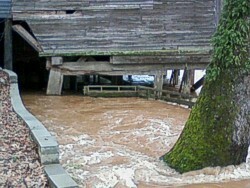 It is feared that the building's foundation will give way to the water's currents and the Mill will collapse and crash into the creek. Our historic treasure could be forever lost. There are several theories as to why the water reaches such high proportions in this particular area. One is that due to down trees, log jams, etc., down creek from the mill, are preventing the water from heavy rains to free flow to the Coosa River. Thus, causing a back flow of water to the dam at the Mill. Another is that, upstream, many years ago, there were spillways built to accommodate logging, and that the spillways are clogged with years of debris and nature's growth. Talladega Creek is considered a navigable waterway and altering the course of it is not allowed. The Childersburg Historic Preservation Commission and the Grist Mill Task Force are diligently working to find a resolution for this problem. 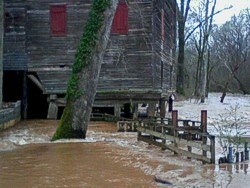 We know that repairs to the Mill's foundation are a priority. We have toured several engineering groups in hopes that one will provide a plan and cost estimate for preserving this valuable landmark. So far, no plan has been presented and since we cannot afford to pay engineering fees, we are looking for a way to divert the water away from the Mill's foundation, at least temporarily, to prevent further damage. Ball park estimates for the Mill's foundation repairs have ranged up to and could exceed $250,000.00. 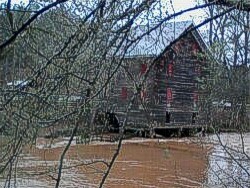 Our covered bridge is in need of work and preservation as well. Just this week, repairs have been made to the bridge. Please support our upcoming events and visit the Childersburg Kymulga Grist Mill and Park!